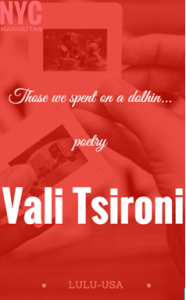 My latest book “Those, which was spent on a dolphin” LULU-USA PUBLICATIONS of BOOKS, is a poetry book with 72 pages. It speaks about love, a surrealistic love, a love from my point of view and feelings. It speaks about all that things that you want to talk with a laud way and you never have the opportunity to say! About all that “not enough” of the soul that screams inside the heart and the mind. The verses in that book of mine, tell us the story of unspoken! As for the rest you have to discover them inside the page! The poetry is a personal journey as a matter of fact! I wanted to tell a story of a love. In a variety of poems the reader can feel all the love, the depression, the laugh, the hopes, the loneliness, the action of two people that sometime into the time met in the half. The half of feelings, the half of actions, the half of true, the half of the words.. And all of the half of others that are into in that feelings. Because the love aren’t always a case between two hearts and minds. The common ideas, the common actions, the common view in the life is a property of strong peoples and a gift of the universe in those hearts that are beyond the others in a world of their feelings and minds. Are they collapses into the unknown? Are they turn that love into a true matter? Or they abandon their heart half? Toys of the heart in a line of a clock!